Environmental wellness inspires us to live a lifestyle that is respectful of our surroundings and encourages us to live in harmony with the Earth by taking action to protect it. Environmental well-being promotes interaction with both nature and your personal environment. Action Plan: Engage in environmentally responsible activities, keep the company of healthy people, and maximize personal harmony with the Earth while minimizing harm to it. Spiritual wellness allows you to develop a set of values that help you seek meaning and purpose. Spirituality can be represented in many ways. It involves developing an inner connectedness and harmony between yourself and the universe. Action Plan: Take “quiet time” to meditate, think or just breathe. Social wellness is being aware of, and participating in, and feeling connected to your community. It helps you perform social roles effectively and comfortably, and create a support network. Social well-being is enhanced by establishing supportive social networks through meaningful relationships. Action Plan: Make an effort to meet your neighbor or members of your congregation. Join or even form a club or team. Designate a night out with friends. 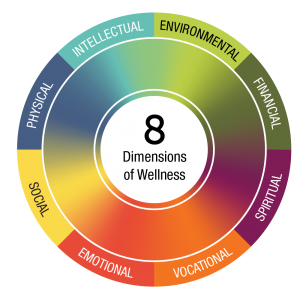 Vocational wellness is inclusive of interests, hobbies, employment, and volunteer work and can be nurtured by matching these areas with your core values. As you uncover your talents and passion, you express yourself to the world. Action Plan: Choose a career path that is consistent with your values. Explore career fields and academic courses to find opportunities to achieve personal satisfaction and to experience the feeling of making a difference in your community and the world. Physical wellness relates to maintaining a healthy body and seeking care when needed. It involves respecting your body’s own uniqueness and diversity. Physical health is attained through exercise, eating well, getting enough sleep, taking steps to prevent illness and recognizing signs and symptoms of illness and seeking out appropriate assistance in reaching optimal health. Action Plan: Play with your kids, walk your dog, cook with friends/family, train for an event. Intellectual wellness involves having an open mind when you encounter new ideas and involves lifelong learning. It encourages active participation in scholastic, cultural and community activities. Action Plan: Take classes offered in your community, participate in something contrary to your strengths and comfort level. Emotional wellness relates to an increased awareness, expression and acceptance of a wide range of thoughts and feelings in yourself and others. It is important to pay attention to self-care, relaxation, stress reduction and the development of inner resources so you can learn and grow from experiences. Optimal emotional wellness helps you to develop satisfying relationships, positive self-esteem and resilience. Action Plan: Take appropriate steps to cope with problems having to do with emotional wellness. Tune into your personal thoughts and feelings. Actively communicate your feelings. Create opportunities for valuable conversations and discussions. Financial Wellness involves the process of learning how to successfully manage financial expenses. Keeping track of expenses, making a budget, and sticking to it are important skills to have in order to be finically responsible, independent, and well. Learning how to maximize your financial wellness now will help you feel prepared to handle potentially stressful financial situations in the future. Action Plan: Take steps to become fully aware of financial state and budgets, save and manage finances in order to achieve realistic goals.